WASHINGTON – In a cordoned-off section of a nondescript hangar at a sliver of a military base that overlooks the Potomac River sits a growing pile of physical evidence of the scale and reach of Iranian-supplied weapons used to further proxy wars against the United States and its allies in the Middle East. Officials first publicly revealed the room’s contents a year ago when U.S. Ambassador to the United Nations Nikki Haley showcased what she called “concrete evidence” that Iran is supplying weapons to Houthi rebels in Yemen’s war with a Saudi-led coalition. Housed at Joint Base Anacostia-Bolling, home of the Defense Intelligence Agency, the weapons, recovered and on loan from Saudi Arabia, Bahrain, United Arab Emirates and Afghanistan, have been seen by more than 1,000 visitors and representatives of nearly 70 nations, officials said. Iran’s President Hassan Rouhani said Wednesday his country doesn’t want a war with the United States and believes America will “sooner or later” support the Iran nuclear agreement again following the Trump administration’s withdrawal. The centerpiece of the evidence last year was debris from a short-range missile fired by Houthis in Yemen at a civilian airport in Saudi Arabia. A year later, in the same week that the U.S. Senate voted 63-37 to advance steps to withdraw U.S. support for the Saudi-led coalition’s fighting in Yemen, U.S. Special Representative for Iran Brian Hook took the stage that Haley occupied during her remarks. Hook, who is also a senior policy adviser to the Secretary of State, said that since last year more weapons with clear markers that Iran manufactures and supplies a host of weaponry. The adviser brushed off questions regarding the timing of the display but did say that “abandoning Yemen right now would do immense damage” to both U.S. national security and the security of the nation’s allies in the region. The weapons ranged from grenades and rifles to the Qiam missile, capable of striking at nearly 1,000 kilometers or more than 600 miles. A missile not on display but of keen interest to leadership is a medium-range missile tested in 2015 that can carry a 500kg payload and reach distances of more than 1,200 miles, Hook said. That puts Middle Eastern allies and some European capitals at risk of a strike, he said. “We are one missile attack away from a regional conflict,” Hook said. A shorter-range but troublesome weapon came in the form of computer software and hardware recovered in the Red Sea, a frequently complicated sea lane that presents a host of maritime strategic challenges for shipping. On display at the event was video showing footage from the Saudi Navy HMS Al Maddinah, a 133-meter, 2,610-ton frigate as it was hit by a semi-autonomous explosive boat that killed two crew members and injured three more. The small boat used in the attack was piloted by a human driver before that person set way points and tracking software and left the boat, leaving the camera to guide the boat into the devastating collision with the Al Maddinah. Pentagon spokeswoman Navy Cmdr. Rebecca Rebarich pointed out various ways in which items were linked to Iran, which included manufacturing methods and designs identical to other Iranian-made defense items, Farsi writing on pieces of equipment, methods of using serial numbers, Iranian company logos imprinted on circuit cards and machined parts and even “Made in Iran” on certain pieces in English. Medium- to longer-range drones on display were recovered in Yemen with 300-kilometer, one-way ranges and a more sophisticated drone that officials said was launched from Iran into Afghanistan and conducted aerial reconnaissance over four coalition and U.S. facilities, as it was capable of a one-way 1,200-kilometer flight. While some of the missiles were slightly upgraded versions of older surface-to-air missile technology, the weapons that cause the most concern and often the most lives were decidedly low-tech. Those included knock-off AK-47s, sniper rifles, rocket-propelled grenade launchers and anti-tank missiles with designs that mimic outdated Russian, Chinese and U.S. weapons small arms. 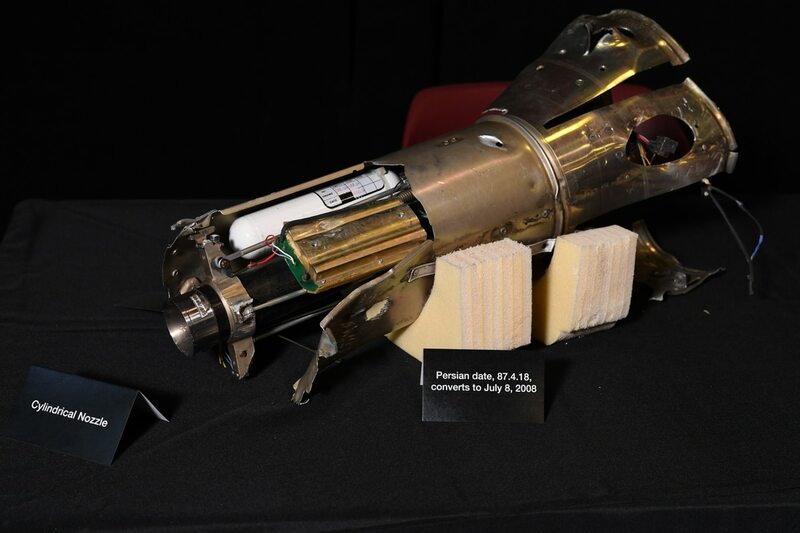 But it is weapons such as these that can be most easily smuggled and used, such as in attacks on diplomatic sites in Baghdad and Basra, Iraq earlier this year by militant Shia groups officials say were supplied by Iran. U.S. officials closed consulate offices after rocket attacks targeted the consulate in September. Hook pointed to those attacks when replying to questions of the U.S. conducting military strikes if the newly re-instituted sanctions don’t have the desired effect of reducing Iranian proxy and instability aims. While officials prefer to use diplomatic tools such as sanctions and building support with other nations to deter Iran, military options remain on the table. “We will not hesitate to use military force when our interests are threatened,” Hook said. But, for now, the aim is to starve the Iranian regime of its oil revenue through sanctions, thereby cutting off funding and support of violent extremist organizations such as Hezbollah, Hamas, the Houthis and the Taliban. That, Hook said, will hopefully drive the Iranian regime back to the bargaining table, which would open up a new deal that would address more than nuclear control but also arms control and support for regional instability that officials said has grown in recent years.